Sanya, the southernmost city in China, is trying to make itself into the Miami of the East as part of a plan to attract more tourists from home and abroad. 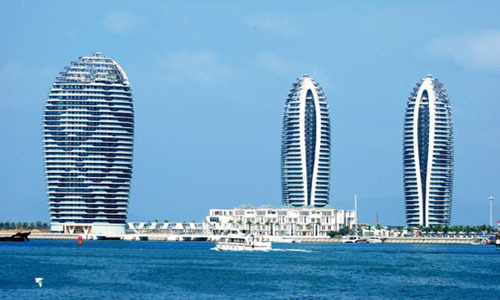 Plans now exist to complete 40 five-star hotels in five years in a 19-kilometer stretch of Haitang Bay in Sanya. According to reports, half of them will be operating before 2015, almost doubling the number of hotels in the city. The massive construction project in the coastal city is a prime example of what’s happening throughout China, as international and domestic companies move quickly to build luxury hotels. According to Meadin.com, a web portal for the hotel industry in China, the country now has 660 five-star hotels and another 500 that are either under development or waiting for five-star recognition. Many large international hotel companies have recently announced development plans for China, not only for the largest cities but also for places that are slightly smaller. The InterContinental Hotels Group Plc now manages 154 properties in China and has another 142 in its plans. The number of hotels under development in China, which accounts for a quarter of the company’s total in the world, is the highest for any hotel group, said Keith Barr, chief executive officer of InterContinental Hotels Group Plc Greater China. "As the first international hotel company to have entered the Chinese market, we arrived here first and we want to stay," he said. Hilton Worldwide, meanwhile, plans to quadruple the number of hotels it has in China by 2014, bringing it to 100. The move will make China the company’s second-most-important market after the United States. Marriott International Inc also has big plans. Every month in the next three years, one hotel under the Marriott brand will be opened, said Simon Cooper, president and managing director for the Asia Pacific division of the company. Figures from the National Bureau of Statistics in China and the United Nations World Tourism Organization indicate that China will move alongside the US to become one of the two largest hotel markets in the world by 2025, when China is expected to have 6.1 million hotel rooms, the same number the US is to have by that time. Boston Consulting Group, a management-consulting firm, has predicted that China will surpass Japan to become the second-largest market for tourism in the world by 2013, holding an 8-percent share of the global market. The increasing popularity of travel has been a driving force behind the construction plans. The China National Tourism Administration said domestic travelers made 2.64 billion trips last year, 13 percent more than in the previous year. The number is expected to increase to 3.3 billion by 2015. At the same time, international travelers made 57.3 million trips, 2.3 percent more than in 2010. Another reason for hotel chains’ ambitious plans is the good business results they have lately enjoyed. InterContinental Hotel Group’s annual report for 2011 showed that its revenue for each available room, or RevPAR, increased by 10.7 percent in China. RevPAR is a gauge of the hotel industry’s performance and is calculated by multiplying a daily average cost of renting a room at a hotel by its occupancy rate. Excluding hotels in Shanghai, which greatly benefited from the 2010 World Expo, InterContinental Hotel Group’s RevPAR in China increased by 17.4 percent in 2011 from the year before. In comparison, the company’s 2011 global RevPAR was up by only 6.2 percent year-on-year.